It was understandably the sincere hope of Master Y'shua's followers that HaShem would bless our master and call him to the office of Moshiach, but it was not to be: The Kingdom was not restored, the conditions were not yet right. The Roman Universal Church was built on the dogma that Master Y'shua was the Messiah. The Roman Papacy sought to usurp authority over his Kingdom and establish itself as the mediator between humanity and HaShem. It condemned all other forms of the Way and declared the Jews heretics and worst. As far as most Romans were concerned they succeeded and the Times of the Gentiles proceeded under the authority of the Gentile Church. This time period is discussed in Prophet John's Book of Revelation where he explains that under the guidance of the Christian Church seven church ages will pass and finally fall into apathy and abuse and be rejected by HaShem. I discuss these seven churches elsewhere. Does it really matter from a practical point of view if Prophet Y'shua is personally going to return as Moshiach or if, as John clearly says in the Book of Revelation, neither he nor anyone else knows the coming Moshiach's identity (Rev. 19:12)? Not really. Micah 6:6 Wherewith shall I come before HaShem, and bow myself before G-d on high? Shall I come before Him with burnt-offerings, with calves of a year old? 7 Will HaShem be pleased with thousands of rams, with ten thousands of rivers of oil? Shall I give my first-born for my transgression, the fruit of my body for the sin of my soul? 8 It hath been told thee, O man, what is good, and what HaShem doth require of thee: only to do justly, and to love mercy, and to walk humbly with thy G-d.
HaShem does not require human sacrifices nor even animal sacrifices. As other Hebrew prophets (Jer 6:20, Micah 6:6-8), Master Y'shua urged the Jews to understand this essential point. Luke 10:25 And, behold, a certain lawyer [one knowledgeable of the Torah] stood up, and tempted [Ekpeirazo: tested his knowledge and teachings] him, saying, Master, what shall I do to inherit eternal life? 26 He said unto him, What is written in the law [Nomos: not just the Written Torah but any ruling, including the Oral Torah]? how readest thou? Here we see the all too human trait that led Israel into so many problems. Master Y'shua taught the same thing as Prophet Micah. Love and serve HaShem and your fellow humans and things will be alright. HaShem isn't looking for fakirs! He wants genuine people with genuine faith and love. He doesn't say you must perform sacrifices, perform rigorous penance or do austerities etc. He doesn't even tell the man he must accept him as his "personal Savior" etc. "But that's too easy!" the man complains. "Where's the ego boost in that! I want difficult rules and regulations! Let's debate this matter rabbi..."
The point is, when Prophet Y'shua was on earth the time simply was not yet right for the Gentile Times to end and he knew it. Yet despite this, through Prophet Y'shua and those who claim to be his followers billions of Noahides came to HaShem despite the continuing influence of Paganism. Prophet Y'shua, the Apostles John, Paul and others warned however that there would come a point when the conditions would be right, when the Times of the Gentiles would end and when the Church, due to rampant hypocrisy and greed, would be cut off from the Tree of Israel (Rom 11, Rev 3:15). 4 [The son of perdition;]Who opposeth and exalteth himself above all that is called God, or that is worshipped; so that he as God sitteth in the temple of God, showing himself that he is God. 24 For there shall arise false Christs, and false prophets, and shall show great signs and wonders; insomuch that, if it were possible, they shall deceive the very elect. Note a very important point in verse 23 etc. It is generally assumed that whenever the New Testament uses the word "Christ" or anointed the reference is to Prophet Y'shua. It is not. Other than when used as a qualifier, such as "Jesus Christ," it is better read as the anointed. We see then that at the time being discussed here, people will be saying, "The Christ is already come! Look he is here!" but in actually he has not yet come. Others will say, "Behold here is Jesus returned!" but they will be wrong. The one who will then be coming onto the scene will be the Antichrist, the false Christ, the one who claims to be the anointing and yet who is a deceiver. The only ways those days of tribulation will be shortened will be for the true Moshiach to arise and save the Elect, People Israel. prophet Isaiah is clear that "in that day" when the Moshiach arises he will battle Israel's enemies and establish the nation as the seat of a global Jewish Kingdom. Once this Kingdom is established, the lion will lay down with the lamb and peace will prevail throughout the planet under the Messianic reign. "...In those days it shall come to pass, that ten men shall take hold, out of all the languages of the nations, shall even take hold of the skirt of him that is a Jew, saying: We will go with you, for we have heard that G-d is with you." The world will look to Israel for its salvation. Master Y'shua predicted dark days for Israel and the Jewish people were yet ahead. However he also assured the Jews that when in the future, at a time he could not foresee nor forewarn them of (Matt 25:13), at a time when they would be facing utter destruction, at that time HaShem would intervene and save His people. The Apostle Paul adds to our knowledge explaining that this "Little Horn," this man of "Son of Perdition," will oppose and exalt himself above all that is called God, or that is worshiped; so that he as God will sit in the Temple of God, showing himself that he is God. ...fled into the wilderness, where she [Israel] hath a place prepared of God, that they [the angels] should feed her there a thousand two hundred and threescore days [which is to say, the final three and a half years of the Great Tribulation]. "And when the dragon [Lucifer] saw that he was cast unto the earth, he persecuted the woman [Israel] which brought forth the man child [ie the Jews, the Servant of HaShem, compare Isaiah 52-54 that clearly references the Jewish people as the Suffering Servant, as I discuss in my study Identifying the Suffering Servant]." Matthew 24:22 And except those days should be shortened, there should no flesh be saved: but for the elect's [the Jews] sake those days shall be shortened." The World Ruler will be like but greater than all other rulers and powers in world history. Verse three is generally understood as the assassination of the Beast. He will be murdered and then rise from the dead as the full incarnation of Lucifer. This isn't the place for this discussion, but in passing this is one of two obscure verses that may refer to the US. It is feasible that the horn that dies from the G-8 (the seven horns above) is the US and that the Rex Mundi will restore this broken nation for his own demonic purposes. Personally I accept the more standard understanding of his death and resurrection, in imitation of the resurrection of Prophet Y'shua. If this is a reference to the US it does not bode well for the country. 4 And they worshipped the dragon [Lucifer] which gave power unto the beast [the Rex Mindi]: and they worshipped the beast [II Thess. 2], saying, Who is like unto the beast? who is able to make war with him? 5 And there was given unto him a mouth speaking great things and blasphemies; and power was given unto him to continue forty and two months [which is to say the thousand two hundred and threescore days or three and half year, ie the second and more difficult half of the coming seven year Tribulation period during which, as discussed above, the Jews have fled into the hills and unto Petra]. It will be at this point, following the resurrection of the coming king, that the Mark of the Beast will become mandatory. 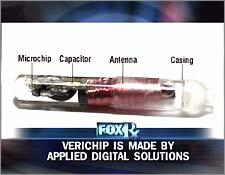 This will almost certainly be a implant designed to tract movement and store financial, medical and legal information. According to the prophecies the recipients of this implant will be required to vow loyalty to the New order. Those who refuse will not be able to buy or sell and will be placed under a death sentence for non-compliance (Rev. 13:17). Zechariyah 14:1 Behold, the day of HaShem cometh, when thy spoil shall be divided in the midst of thee. 2 For I will gather all nations against Jerusalem to battle; and the city shall be taken, and the houses rifled, and the women ravished; and half of the city shall go forth into captivity, but the residue of the people shall not be cut off from the city. 3 Then shall HaShem go forth, and fight against those nations, as when He fighteth in the day of battle. 4 And His feet shall stand in that day upon the mount of Olives, which is before Jerusalem on the east, and the mount of Olives shall cleft in the midst thereof toward the east and toward the west, so that there shall be a very great valley; and half of the mountain shall remove toward the north, and half of it toward the south. 9 ...And HaShem shall be King over all the earth; in that day shall HaShem be One, and His name one. 10 All the land shall be turned as the Arabah, from Geba to Rimmon south of Jerusalem; and she shall be lifted up, and inhabited in her place, from Benjamin's gate unto the place of the first gate, unto the corner gate, and from the tower of Hananel unto the king's winepresses. 11 And men shall dwell therein, and there shall be no more extermination; but Jerusalem shall dwell safely. "Now HaShem said unto Abram: 'Get thee out of thy country, and from thy kindred, and from thy father's house, unto the land that I will show thee. And I will make of thee a great nation, and I will bless thee, and make thy name great; and be thou a blessing.